This is a major project i'm going to start undertaking in the weeks to come, posting bits of this bid for the first non-winter 2012 games (20th Games if I'm right). I'll also bid for the 19th ISC Session. Because West Coast is only a few miles from the French South Juliet area, and also not far from the Dutch speaking cities of Gezag and Raakstad, this bid is brought to you in English, Dutch and Frenchv. 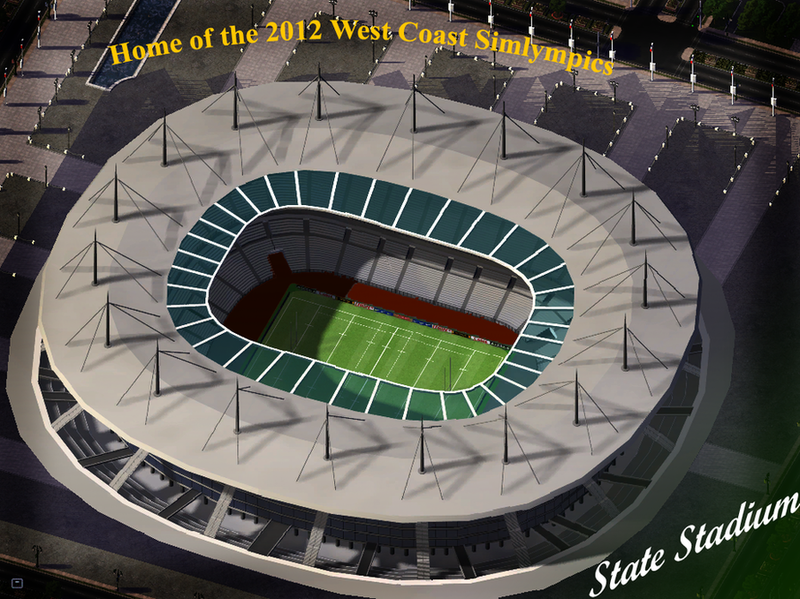 "A Slogan like no other"
"Een slogan als geen ander"
"Un slogan pas comme les autres"
State Stadium, home of West Coast State sponsored activities, is the epicenter for these Simlympics XVI. Home to 82,000 people when filled to capacity, State Stadium has the facilities to provide the greatest Opening Ceremony of any Simlympics yet. State Stadium, de thuisbasis van West Coast staat gesponsorde activiteiten, is het epicentrum voor deze Simlympics XVI. De thuishaven van 82.000 mensen wanneer gevuld, State Stadium heeft de faciliteiten om de grootste openingsceremonie van elke Simlympics nog te bieden. State Stadium, domicile de l'Ouest Côte d'activités parrainées Etat, est l'épicentre de ces XVI Simlympics. Accueil à 82.000 personnes quand il est rempli à pleine capacité, l'Etat a le Stade installations pour fournir de la cérémonie d'ouverture plus grande de toute Simlympics encore. West Coast Baseball Stadium, home of BC Capital West of the Meridianian National League, the premier professional baseball league in the nation. It will be accompanied by stadia in South Juliet and Silver Coast to host the baseball portion. 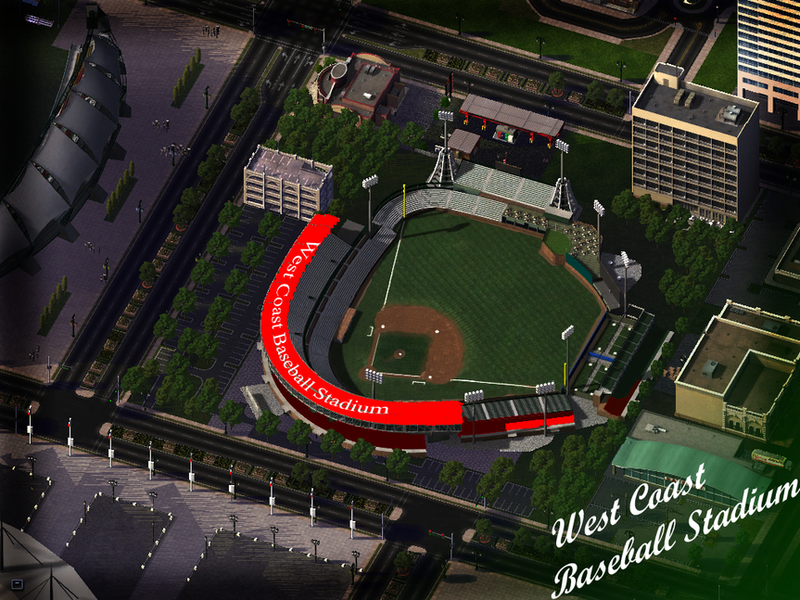 West Coast Baseball Stadium, de thuishaven van BC Hoofdstad westen van het Meridianian National League, de Premier Professional Baseball League in de natie. Het zal gepaard gaan met stadions in Zuid-Juliet en Silver Coast naar de honkbal gedeelte host. est Coast Baseball Stadium, domicile des BC Capital Ouest de la Ligue nationale Meridianian, la ligue de baseball de premier professionnel dans la nation. Il sera accompagné par les stades du Sud Juliette et Côte d'Argent pour héberger la partie de baseball. 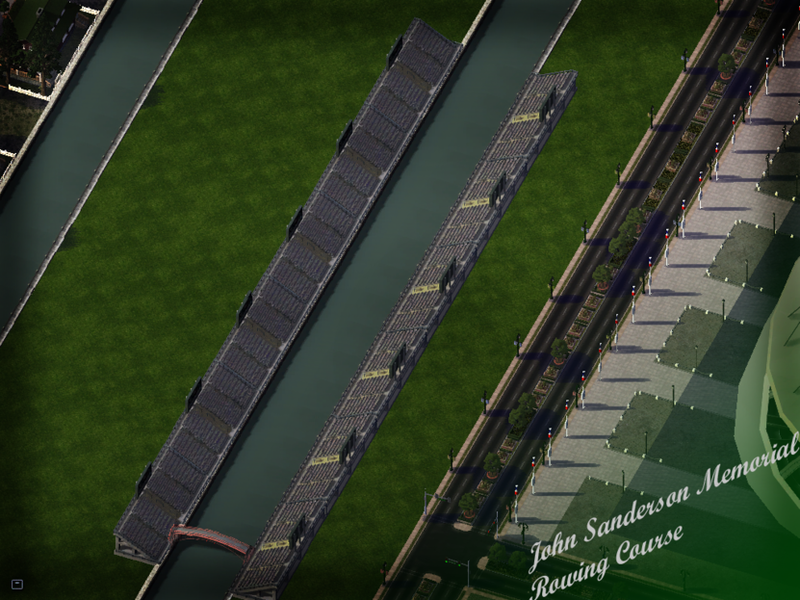 John Sanderson Memorial Rowing Course, a 2 kilometer water stretch neighboring the athlete's accommodations east of the main city. This will host over 20,000 for the events and can serve as a city park after the games. John Sanderson Memorial roeibaan, een 2 kilometer water stretch buurlanden van de atleet accommodatie ten oosten van de hoofdstad. Dit zal gastheer meer dan 20.000 voor de evenementen en kan als een stadspark te dienen na de wedstrijden. John Sanderson Cours d'aviron Memorial, un tronçon de 2 km d'eau voisins hébergement est de la ville principale de l'athlète. Cette accueillera plus de 20 000 pour les événements et peut servir comme un parc de la ville après les matchs. 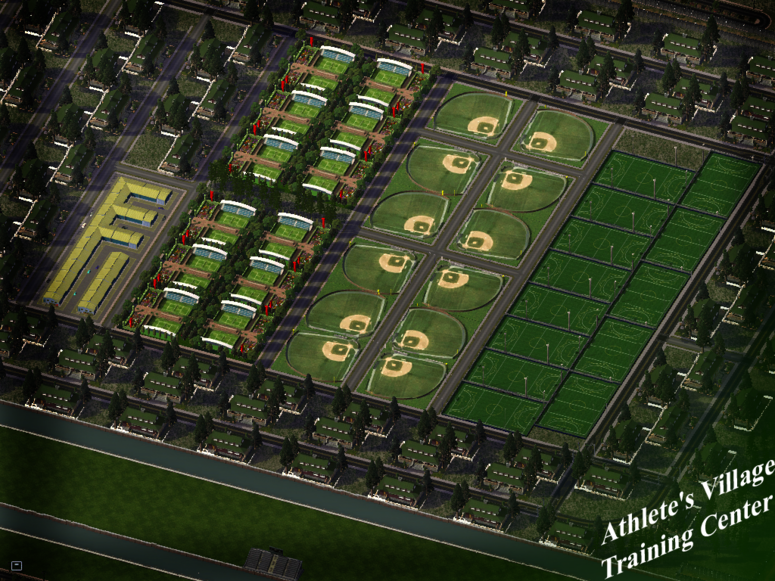 The Athlete's Village and Training Center comprises 430 acres neighboring Simlympic Park. In total, housing for 150+ nations is easily possible with these buildings. Also included are 13 Football Fields, 24 Tennis Courts, 12 Baseball Fields, 12 Indoor Basketball Courts, 6 Boxing Rings, an Archers Range and a Firing Range. When not being used for competition, the return stretch of the rowing arena is also available for training. De Athlete's Village en de Training Center bestaat uit 430 hectare aangrenzende Simlympic Park. In totaal, huisvesting voor 150 + landen is eenvoudig mogelijk met deze gebouwen. Ook inbegrepen zijn 13 voetbalvelden, 24 tennisbanen, 12 Baseball Velden, 12 Indoor basketbalvelden, 6 Boxing Rings, een Archers Range en een schietbaan. Als hij niet wordt gebruikt voor de concurrentie, de terugkeer deel van de roei-arena is ook beschikbaar voor training. Le Centre sportif du village et de formation comprend 430 acres voisins Simlympic Park. Au total, 150 logements pour les nations + est facilement possible avec ces bâtiments. Sont également inclus les 13 terrains de football, 24 courts de tennis, 12 terrains de baseball, de basket-ball 12 Tribunaux d'intérieur, 6 rings de boxe, une gamme archers et un champ de tir. Lorsqu'il n'est pas utilisé pour la compétition, le tronçon le retour de l'arène aviron est également disponible pour la formation.